The Eclectus Parrot is a moderately-sized, colorful, and very active parrot. They have some dietary and emotional needs that can be challenging for the new pet bird owner but can make a wonderful pet for an experienced bird owner. These parrots are not particularly cuddly but do enjoy spending time perched near or on their owners. The Eclectus Parrot is a companion bird whose scientific name is Eclectus roratus. 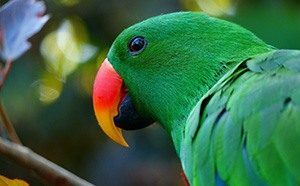 According to parrots.org, this bird can also be called the Kalanga, Grand Eclectus Parrot, King Parrot, and the Red-Sided Eclectus Parrot. There are 10 subspecies with three, the Red-Sided, Solomon Island, and Vosmaer’s Eclectus most commonly kept as pets. These birds’ natural habitat is in Indonesia, the Solomon Islands, New Guinea, and Northern Australia. An average Eclectus Parrot is about 13.6 inches (35 cm) in length and weighs between 15.75 and 21 ounces (450-600 g). They feed on fruits, berries and nuts in a wide range of settings ranging from forests to mangroves. Gender identification is no problem with the Eclectus, as the male’s coloration is green and the female is red. The two sexes look so different that they were considered different species until the late 19th century. What Does an Eclectus Parrot Look and Sound Like? The striking difference in genders is rare in the world of parrots and led to early breeders unsuccessfully attempting to breed two males or two females. 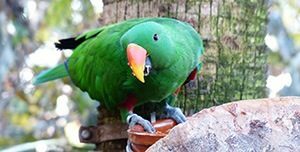 Male Eclectus Parrots are bright green with an orange beak and tend to have tail and wing feathers that are blue or red. The female of the species is predominately red with a blue breast and black beak. Their feathers appear to be almost like a fine fur. These parrots can be very vocal, though they are not known to be extremely noisy. They can develop extensive vocabularies by mimicking the human voices around them as well as replicating many other sounds in their environment. Below is a video showing that demonstrates the speaking skills of a male Eclectus Parrot. What Kind of Personality Does an Eclectus Parrot Have? Eclectus Parrots are very active and intelligent birds that can make excellent pets in the right circumstances. According to beautyofbirds.com, the bird’s personality was misunderstood as it was thought to be a dull, shy, and boring bird. The reality is that these parrots are extremely cautious around new people or in unfamiliar situations and tend to freeze and wait to see how things will develop. When they are in a familiar setting with people they know, these birds are very talkative, curious, and playful. These parrots do require interaction and regular training from a young age or can become stressed to the point where they do not want to leave their cage. Getting along with other birds is not a problem for the Eclectus, though when introducing a new bird you need to ensure that you maintain the first bird’s routine to avoid jealousy. If kept around children, it is up to the child to understand the parrot’s limits. They are not fond of quick and sudden movements, so small children should be supervised around the bird. Daily interaction is required or your bird can feel neglected and become stressed, leading to feather plucking or excessive screaming. The intelligence of these birds makes them amenable to training and they can be taught tricks as well as to mimic human speech. They also need to be trained consistently to curb behavioral problems such as excessive chewing, biting and screaming. Positive reinforcement and gentle guiding away from unwanted behavior is the best way to train these parrots. Females are more aggressive than males and do better in very active and noisy households. A male Eclectus will get stressed if there is too much activity going on around them. 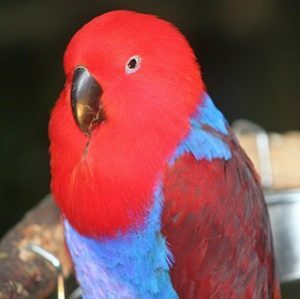 How Should I Care for My Eclectus Parrot? Eclectus Parrots will do well at temperatures of between 70-80°F (21-27°C). You should obtain the largest cage you can for these active birds. According to birdtricks.com, the minimum size of the cage should be 36Hx36Wx24L inches (91Hx91Wx61L cm), but a larger cage than this is preferred. Bar spacing should be 3/4 to 1 inch (1.9 to 2.54 cm), and Eclectus Parrots do very well in Macaw cages. They love to climb so cage height is important. Their diet should consist of only about 10% of color-free pellets with the rest being fresh fruits and vegetables. These parrots can molt their head feathers throughout the year and their larger wing and tail feathers twice yearly. You will probably have to file your bird’s nails regularly to prevent overgrowth. Baths and showers are greatly appreciated, and a shower perch is a great way to keep your Eclectus happy. Eclectus Parrots can be bred, and there is no particular season for breeding captive birds. Infertile eggs can be a problem, as females mature sexually more quickly than males. A typical clutch consists of two eggs. How Healthy Are Eclectus Parrots? Eclectus Parrots are generally hardy birds but can be prone to feather plucking when stressed or neglected. They have delicate digestive systems and can develop wing or toe-tapping spasms due to vitamin and mineral imbalances. They can live for up to 30 years in captivity and 50 years in the wild. Below is another video showing a male and female Eclectus interacting. To buy a new Eclectus Parrot, you’re going to be spending $1000 to $2000 for the most common species of these birds, the Eclectus Roratus. The red female Eclectus tends to be priced higher than the green male version of the Eclectus. The subspecies of Vosmaeri Eclectus Parrots which can be found on an average being priced at $2000. There is also the Solomon Island Eclectus, which normally gets priced at around $1500 to $2500. The unique Blue Solomon Island Eclectus color mutation of this bird is currently being sold by a few breeders for the hefty price tag of $15,000 to $22,000. In addition to buying the bird itself, you’ll also need a fair amount of bird supplies. 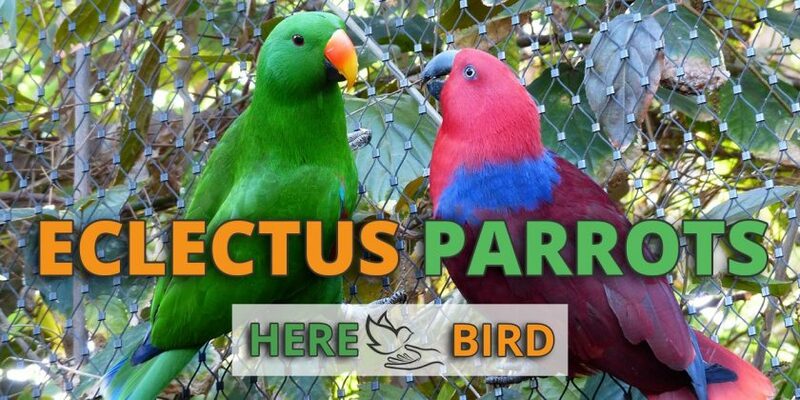 Since Eclectus parrots are fairly large, you’re going to have to accommodate them in a fairly large cage as well which will cost several hundred dollars. Toys will need to be purchased to keep the birds mentally sharp, and their diet of pellets and fresh food can become expensive. Nail filings, beak trimmings and yearly trips to the vet are another expense to be considered. Is an Eclectus Parrot Right for Me? These beautiful and serene parrots can make great pets for the bird owner with the time and patience to properly train and attend to their needs. They are sensitive birds and can become stressed in very active households or if their cage is located in a particularly busy part of the house. If you can provide them with what they need, they will become an important member of your family.